The Mercedes-Benz GL-Class is the company’s biggest SUV, a seven-passenger, full-size sport utility vehicle. Large and luxurious, the GL is built in the United States alongside the M-Class mid-size SUV and the R-Class touring wagon. The GL is designed to appeal to Mercedes-Benz sedan owners who want the off-road, seven-passenger, and 7,500-pound towing capabilities that come with a full-size SUV along with the luxury and safety features they have in their other Mercedes vehicles. All 2009 GL-Class models feature a new standard COMAND integrated accessory control system, which features a 6.5-inch color display screen; in-dash, six-disc DVD / CD changer; and Bluetooth interface. And for safety, the GL adds Mercedes’ Pre-Safe system, which can sense an impending collision before it happens and take measures to protect occupants during those valuable seconds before impact. While their names sound similar, don’t confuse the GL-Class with the venerable G-Class or Gelandewagen. The GL shares nothing in common with the utilitarian G-Class. The GL-Class shares its basic platform with the ML-Class and R-Class. The Mercedes-Benz GL-Class is large and capable off road yet feels surprisingly car-like on the road. That car-like feeling comes in part because it is built around a unibody architecture instead of traditional body-on-frame construction. Mercedes says the GL is strong enough to tow a 30-foot boat, a trailer carrying three horses, or a large travel trailer, but verify tongue weights and ratings before making decisions. All GL-Class models come with a seven-speed automatic transmission and four-wheel drive. All seat up to seven people. 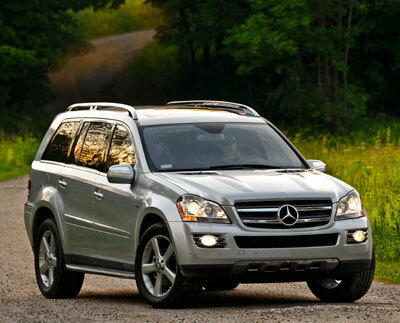 The 2009 Mercedes-Benz GL-Class offers three models differentiated primarily by engines and features. The GL320 BlueTEC uses a 3.0-liter turbo-diesel with state-of-the-art emissions controls. The GL450 comes with a 335-hp V8 engine, while the GL550 uses a 382-hp 5.5-liter V8. All GL-Class offerings come with a seven-speed automatic transmission, 4MATIC all-wheel-drive system, and Airmatic air suspension system. All come with seating for seven and with a third row that powers up or down at the touch of a button. GL320 BlueTEC ($59,075) and GL450 ($60,075) are similarly equipped, with cloth upholstery, a power driver’s seat, heated power mirrors, heated windshield washer nozzles/lines/reservoir, reading lamps, burl walnut trim. A Premium Package ($6,600) includes Keyless Go, which allows the engine to be started as long as the key is inside the vehicle and locked/unlocked with touching the key; Parktronic, which uses sonar to detect obstacles near the vehicle; a harman/kardon Logic 7 surround sound system; DVD-based navigation; and other conveniences. Buyers can also choose a rear-seat entertainment system with two screens ($1,850) and full leather upholstery ($2,130). The complete list of options too long to repeat here. The GL550 ($82,175) comes with full leather, Parktronic, rear-view camera, premium audio, adaptive bi-xenon headlamps, infrared-reflective glass, heated steering wheel, heated front and middle-row seats, and Adaptive Damping Suspension. Keyless Go has been added to its standard equipment for 2009. Safety features that come standard include eight airbags, including side airbags for all four outboard first and second-row seating positions as well as side curtain airbags that protect occupants in all three rows. GL models come with active front head restraints, LATCH tethers for child safety seats, and three-point safety belts for all seating positions; make sure everyone in the vehicle always wears those seat belts because they’re your first line of defense in a crash. Active safety features (to help you avoid a crash) include an Electronic Stability Program, anti-lock brakes with Brake Assist Plus, and four-wheel electronic traction control. Optional safety features include Parktronic and a rear-view camera, each of which can help alert the driver of obstacles or people, including children, behind the vehicle. The last time we checked, the GL-Class did not come with child locks on the rear side doors. New for 2009 is Pre-Safe, a system which can actually sense an impending collision. Introduced previously on the Mercedes-Benz S-Class sedans, Pre-Safe automatically tightens the front seat belts and moves the front passenger seat to a position that can provide better protection. Side windows close to provide better support for the curtain air bags. If the system senses an impending rollover, the sunroof also closes. The Mercedes GL-Class has similar styling cues to those of the M-Class (ML), but applies them to a larger package and adds some strong, more muscular touches. For example, both in front and at the rear, a metal skid plate (designed to protect underlying mechanical parts from damage when driving off pavement) is a prominent feature that underscores the GL's image of strength. Unique to the GL550 is a deeper, more aggressive front-end treatment, including a larger three-pointed star. It also features larger fender flares to cover the massive tires and dual-split exhaust outlets. Seen in profile, the nicely raked windshield and bulging wheel arches over large wheels (18-inch and larger) help balance what is basically a tall and long vehicle. But even being tall and long, the GL doesn't look as bulky as, say, the Chevy Tahoe and GMC Yukon. And even with the squared-off rear edge of its D-pillar, the GL doesn't look as boxy as the Jeep Commander. Viewed from the rear, the GL offers a formidable stance. It's tall and wide, with a large rear hatch opening and large tail lights, all sitting above a substantial skid plate bracketed on either side by large, rectangular exhaust pipes. Compared to the ML, the GL is over a foot longer overall and an inch wider in track (the left-to-right distance between the centers of the tires), though it is barely a hair wider overall and not quite an inch taller. Despite their similar styling, the Mercedes SUVs share only their front doors; otherwise, each has unique sheet metal. As large as the GL may appear, it's three inches shorter than the R-Class touring wagon, which also has three rows of seating, though with less room for seven occupants. The GL is built using unibody construction rather than the body-on-frame design that full-size pickups and SUVs traditionally use. Mercedes notes that because of this architecture, the GL-Class is 300-600 pounds lighter than its full-size competitors. To make sure the GL class is strong enough, 60 percent of the vehicle structure is made from special high-strength steel. While the Mercedes GL may look sleeker than its competitors, it was designed to offer class-leading interior room and ease of entry and exit. Cargo space also benefits. With all seats in their upright position, there's still 14 cubic feet of storage between the third-row seatbacks and the closed rear hatch door. A power folding feature for the third row is standard equipment on the GL with controls near the rear hatch and next to the right-side second-row passenger's seat. Power down those third-row seats, and cargo capacity expands to 43.8 cubic feet. Fold down the 60/40-split second row seats and the GL provides as much as 83.3 cubic feet for cargo. There's also room under the cargo floor for a full-size spare tire. The interior layout is familiar to Mercedes drivers, with deluxe cloth or real leather trim for the seats (Mercedes notes that not all luxury car buyers want leather seating surfaces), wood trim and metal rings around gauges, air vents, and cup holders. The second-row seats provide ample legroom. When occupied by only two people, the back of the center section can be folded down as an armrest and storage tray. We climbed into the third row and found room for two adults to ride back there, each in a separate seat. The room is enhanced by foot wells for your feet so you don't sit with your knees at chest level, and even the third-row seats are thickly padded to provide comfort. Fears of claustrophobia back there evaporate quickly thanks to the sunroof that extends over the third row. For 2009, all GL models come with a new, standard COMAND system, a touch-screen affair that manages all accessory systems. It features a 6.5-inch color display screen; a standard in-dash, six-disc DVD / CD changer; and a Bluetooth interface that allows a phone still in a pocket or purse to be operated through the car's audio system. COMAND can also be equipped with an optional iPod/MP3 interface, Sirius satellite radio, HD radio, and an enhanced voice control system. It can play tracks stored on a data CD, DVD or SD memory card. The new system can also display maps and directions for the optional hard-drive navigation system, which can be set up for SIRIUS real-time traffic info and Zagat restaurant ratings as well. All GL-Class models can be equipped with an optional 610-watt digital harmon kardon Logic7 audio system, and a rear-seat entertainment system that includes two eight-inch screens (mounted in the rear of the front-seat headrests), wireless headphones and an integrated DVD player with dual-source capability. Driving the Mercedes GL-Class SUVs doesn't feel at all like driving the typical full-size sport utility vehicle. While this is a substantially sized vehicle, it is not truck-like. The Mercedes has a much more car-like dynamic. Factory estimates say the GL550 can accelerate from 0 to 60 mph in 6.4 seconds. Its 382-hp V8, with four valves per cylinder, is part of a new family of V8 engines from Mercedes-Benz, all designed with a broad torque spectrum for hauling around 2.5 to 3.5 tons of truck. The GL450 is more than adequate with its 335-hp V8 if towing or speed contests aren't on your agenda. Apart from the 21-inch wheels and more aggressive bodywork, a GL450 can be optioned to match a GL550 in features. Indeed, for poor road areas, severe winter climes that frequently require snow chains, or those inclined to use the low-range gear in the Off-Road package, the GL450, with its standard 19-inch wheels, is the better choice. We haven't tried the new BlueTEC diesel in the GL-Class, but its predecessor delivered more than adequate thrust from a little turbo-diesel V6. Like that engine, the new BlueTEC unit actually boasts more torque than the GL550's hefty V8: 398 pound-feet, at 1600-2400 rpm; vs. 391 at 2800-4800 for the hot rod model. And it's torque, not horsepower, that gets you going and pulls trailers up hills. (Properly equipped, the BlueTEC tows the same 7,500 pounds as the GL V8s.) If high-altitude driving is routine, it's worth noting the turbocharged diesel engine loses far less of its power than the normally aspirated gasoline engines as the air gets thinner. And of course the BlueTEC delivers better fuel economy than the V8 models, with an EPA estimated 17 mpg city/23 mpg highway. With a 26.4-gallon tank that means a cruising range of 600 miles. For comparison, the GL450 rates 13/18 mpg city/highway; the GL550, 13/17. A seven-speed automatic transmission helps keep all the GL-Class engines operating in the sweet part of a power band. The four-wheel-drive system, called 4MATIC, features front, center and rear differentials. Quite sophisticated, 4MATIC is designed to maintain mobility even when only wheel has traction. In normal driving, the system distributes power equally to front and rear wheels. The system includes DSR, a sort of cruise control for regulating downhill speed, and Hill-Start Assist, which keeps the GL from rolling backward when launched after being stopped on an uphill slope. 4MATIC also adjusts anti-lock brake controls to provide quicker stops on slippery and unpaved surfaces, an important benefit many vehicles with ABS do not offer. Airmatic is an air suspension system that uses air bladders instead of coil springs to adjust ride height by as much as three inches, as well as ride firmness and body control parameters, so the driver can select from comfort and more aggressively sporty settings. The system automatically lowers the vehicle to enhance handling and aerodynamic efficiency at speeds of 77 mph or higher. Adaptive Damping II, which provides electronic control and driver-selection of shock settings for the best combination of ride comfort and handling response, is standard on the 550, optional on the 450 and 320. We did our driving on freeways in and out of San Francisco's airport and on roads through Napa Valley wine country. Steering feedback was consistent, brakes (14.7-inches in diameter on the front wheels and 13.0 inches on the rear) were responsive and consistently predictable and the GL offered nice balanced dynamic capabilities when hustled through the curves on the narrow, hilly roads that wind through the vine-covered hillsides. The 550's fat 21-inch tires contribute commendable grip, and like the majority of wide, low-profile tires, follow pavement grooves, give sharper impact sensations, and can not use tire chains. The full-size Mercedes-Benz GL-Class SUVs are larger than the mid-size M-Class. The GL provides more car-like dynamics than the traditional, full-size, body-on-frame SUVs from other automakers, yet can tow big trailers. NewCarTestDrive.com contributor Larry Edsall filed this report from California's Napa Valley. Head/hip/leg room, f: 40.1/NA/40.3 in. Head/hip/leg room, m: 40.6/NA/39.5 in. Head/hip/leg room, r: 38.2/NA/34.2 in. Cargo volume: 83.3 cu. ft.